We’ve brought back an old favorite this month, The Gallery Roundup! And be sure to check out and keep up to date with all of our most recent galleries as they go live here. [/URL] And remember TokuNation is your #1 stop for comprehensive image galleries and in depth reviews for the latest & greatest toys. We’ll be back soon with more! Unleash the power! Dinosaur might, ready to fight! We’ve just unleashed the power of the Graphite Ranger from Power Rangers Dino Charge 5″ toy line and tossed up the gallery of this Pachy-Power menace to Sledge and his team! Check out 26 high-resolution images of this hard-to-find and highly-in-demand figure by clicking here or by clicking “Discuss on TokuNation forums” link at the bottom of the post! What do YOU think of the Graphite Ranger? Have you picked up yours yet? Have you even found one? Sound off in the discussion thread! Rounding out our coverage of San Diego Comic Con 2015 we have a couple gems to share with you. Our own Kickback just sat down with Bandai of America for an interview on current & upcoming products and a few other goodies fans have been clamoring for with Power Rangers Legacy & Dino Charge. Starting things off we discussed Power Rangers Legacy items. These releases were apparently never meant to be chronological like collectors had assumed, it happened to just turn out that way. Bandai knows that the Ninja & Shogun Megazords as well as the Falconzord are all very obvious choices for the future. Power Rangers Zeo is also internally very popular. They also think a Legacy Gold Zeo Ranger Staff is a interesting idea ;) Legacy Tor was mentioned as well but as a whole they don’t want to destroy collectors’ wallets. For Dino Charge Bandai still asserts that if a Ranger appears in show, of which there’s likely to be 11 between DC & Supercharge, then there’s a very good chance to see it in toy form. When asked about any possible gender swaps or sash swaps in the show, they referred back to the first answer. Bandai is also taking this position with Megazords, if it appears in the show footage it’s very likely to receive a toy. Villain figures are a key point of interest to Bandai as well since this is the first time since MMPR that waves are predominantly villains. Poisandra however is still cloudy. While Bandai is looking into it, it depends entirely on the characters trajectory in the show. They simply don’t know currently. The same can be said for why no Supercharge items were displayed – if it hasn’t been revealed in the show then they can’t necessarily show it in toy form without approval from Saban Brands. Fans of Ranger Keys from Super Megaforce will also be sobered a bit. 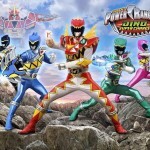 Currently no plans for more Ranger Keys as the play pattern is no longer current. Speaking of exclusives Bandai confirmed that they are upping their game for New York Comic Con to match the cons size. They will have an exclusive of some kind for this years show. Bandai of America takes the fan opinion very seriously. They also want to cater to collectors and use the Legacy line as well as conventions to try and do that. They encourage fans to let them know what they think at conventions and such. 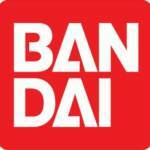 We’d like to thank Bandai of America for their time over the weekend for answering our questions and being awesome in general. The team is super excited for the future and can’t wait to show you what’s in store next. They hope you’ll come see them at this year’s NYCC. 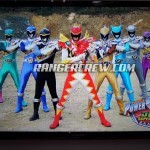 SDCC 2015 Power Rangers Dino Charge Panel Round Up With Pics! More coverage is rolling in from San Diego Comic Con 2015! Just now our own Kickback and the SDCC network crew attended Saban Brand’s Entertainment’s Power Rangers Dino Charge panel! Presented below is a round up of the information from that panel as well as pictures from it! The core cast of 5 rangers & Claire entered the panel each with their own unique spin on things, like Yoshi doing a flip & Camille punching the air. The panel began with some basic info about the actors like how this SDCC was Camille, Michael, James & Claires first ever, and how all were very excited. Everyone discussed their favorite seasons of the franchise. We got some insight into how Yoshi came from fan/stunt actor to full blown Power Ranger. Some great fun stories about each of the actors as well, like James being a terrible tour guide in his native New Zealand. The crowd and fans everywhere agree, this cast is fantastic and fun in person. Chip Lynn along with Saban Brands Entertainment EP Brian Castatinni then took stage to assure fans that in future episodes we would see more rangers and that the joke was on us, things we thought they missed? They didn’t. According to him there are “no bad episodes this season”. Chip restated in no uncertain terms that “When this season is done, you’re going to say they were some of the best episodes of Power Rangers EVER.” The crowd was pleased and ready for more. After dashing hopes about past Dino Rangers ever returning we were treated to 2 videos. One a fall Dino Charge episodes trailer, which at last revealed it’s August 29th return date! And another which was a 2016 trailer for Dino Supercharge, the footage was actually reused from the Licensing Expo Marketing Teaser. While we didn’t get to see the people behind the suits these video treated us to Gold, Purple, & Graphite Ranger footage! And after this 5 suit actors arrived wearing the brand new Dino Drive power up suits from Dino Supercharge! The above article contains a round up of the pertinent information from the panel. Please click “Discuss on the TokuNation Forums” at the bottom of this page to check out the full breakdown of the panel in tweet form. Another find by the awesome @razzle1337 on Twitter brings us the official images for the Power Rangers Dino Charge 5″ figures of the Gold Ranger, Graphite Ranger, and the Ptera Charge Megazord! These figures are currently available, having been located in Wal-Mart stores, but these are our first official images of these figures. Join in our discussion – are these MUST BUY figures? How much longer do we have to wait for the other Dino Charge Power Rangers? Sound off! Another find by the always amazing @razzle1337 on Twitter shows us the official images for the next wave of the Power Rangers Dino Charge Bike with Figure! 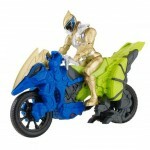 Check out the Gold Ranger and the Graphite Ranger rocking their bikes in these photos of the upcoming toys! Do you plan to pick these up to add to your collection of figures with bikes? Sound off in discussion! 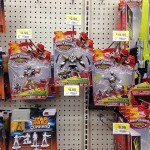 After a case assortment pre-order for Power Rangers Dino Charge 5″ Wave 5 was posted at Entertainment Earth just yesterday, someone has already found them at US retail! Instagram user @mikey_the_husky was lucky enough to stumble across the 5″ Ptera Charge Megazord, Gold Ranger & Graphite Ranger at Walmart in Dinuba, CA. “900 years ago, Ivan was a valiant young knight who dared to chalenge Fury for the Gold Energem. Having finally escaped his imprisonment years later, Ivan joins the Power Rangers as the Gold Ranger. He brings legendary skill to the team as we wield’s a magnificent saber and morpher that doubles as a weapon”. Let us know if you find any of the new Wave 5 Dino Charge figures by posting in our Toy Sightings forum, a state by state breakdown of what you can find and where! Discuss on the Tokunation Forums› Views: 5800 › Credit: @mikey_the_husky on Instagram! 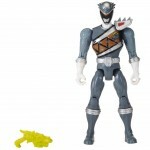 Dino Charge 5 Inch Graphite Ranger Figure Revealead! Thanks to twitter user @Rickman0804 for this one! 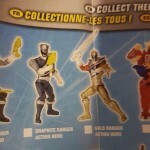 Revealed via a Dino Charger packaging insert image we have our first look at the 5″ Graphite Ranger figure from Power Rangers Dino! Graphite Ranger, as well as the other extra rangers this season have yet to receive much or any attention yet from Bandai Of America’s toyline. However we knew from our Toy Fair 2015 coverage that the Packy Zord for Graphite was on it’s way. So It’s good to see the extra rangers have NOT been forgotten by the 5″ line! Discuss on the Tokunation Forums› Views: 3815 › Credit: @Rickman0804 on Twitter!